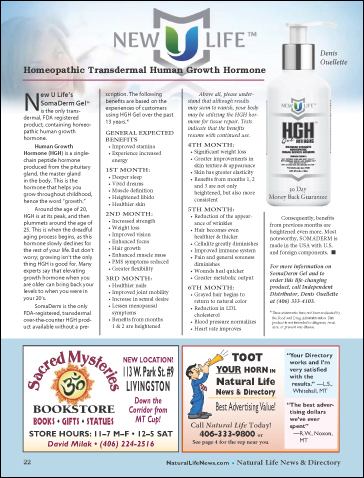 NewULife’s SomaDerm Gel™ is the only transdermal, FDA registered product, containing homeopathic Human Growth Hormone (HGH), which is a single-chain peptide hormone produced from the pituitary gland, the master gland in the body. This is the hormone that helps you grow throughout childhood, hence the word “growth”. Around the age of 20, HGH is at its peak, and then plummets around the age of 25. This is when the dreadful aging process begins, as this hormone slowly declines for the rest of your life. But don’t worry; growing isn’t the only thing HGH is good for. Many experts say that elevating growth hormone when you are older can bring back your levels to when you were in your 20’s.